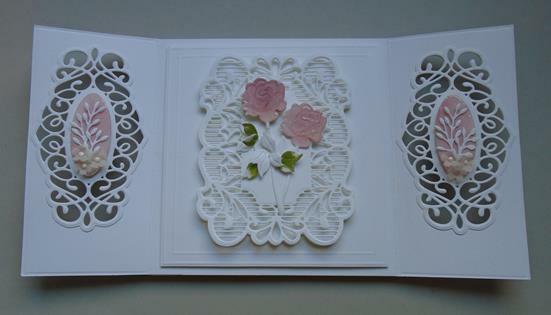 This project shows how to make this intricate gatefold easel card . 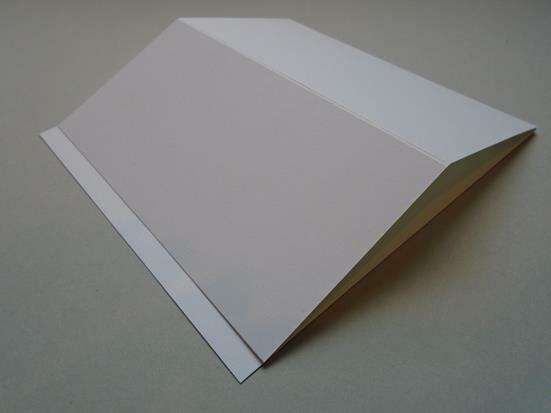 The card is folded flat to send the card and then the recipient will get a nice surprise when it`s opened. 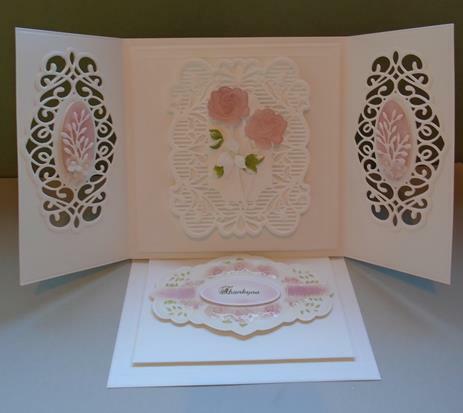 The delicate dies work perfectly with this style card. Step 1. 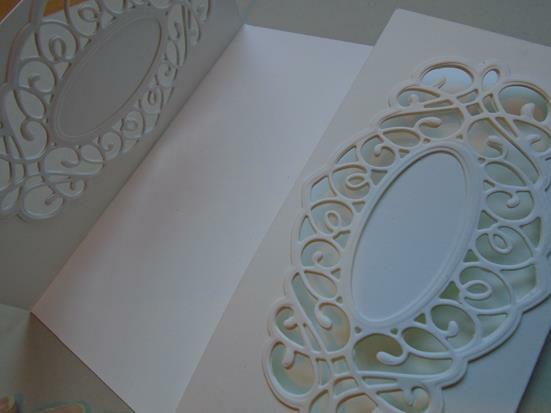 This workshop will show you how to make this dimensional gatefold easel card using the following main products…… The Creative Expressions Sue Wilson tags & frames Molly die with the coordinating stamps to die for …. 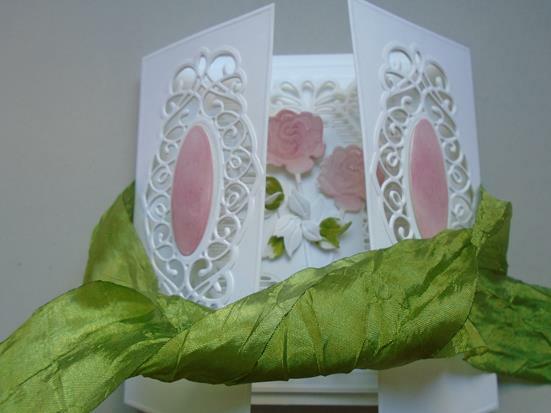 ribbon rose frame stamp. 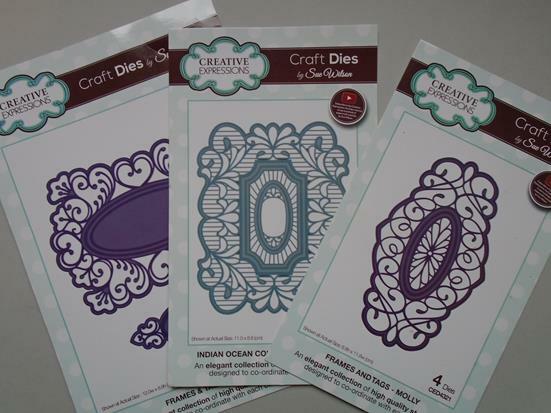 Also needed is the Sue Wilson Indian Ocean collection ~ Mauritius die, the wild rose die, the olive branch die and finally the delicate garden frame die. All the other products are listed on the page above. Step 2. 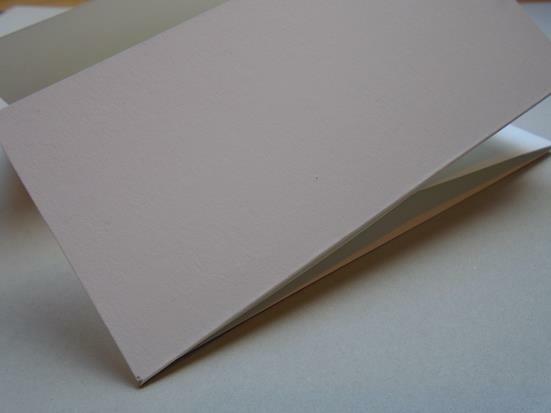 Take a piece of Foundations coconut card lay it in a landscape position and score at the A4 gatefold marking. Turn the card 180 degrees and repeat the same scoring. Step 3. This will have created the gatefold shape with a small gap visible down the centre which isn`t a problem with this design. Step 4. 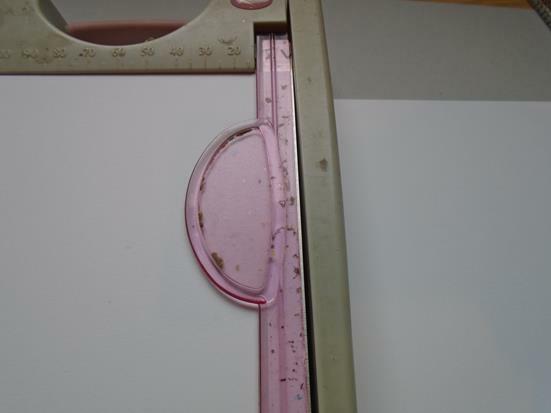 Measure 15cms down the side of the gatefold. Step 5. 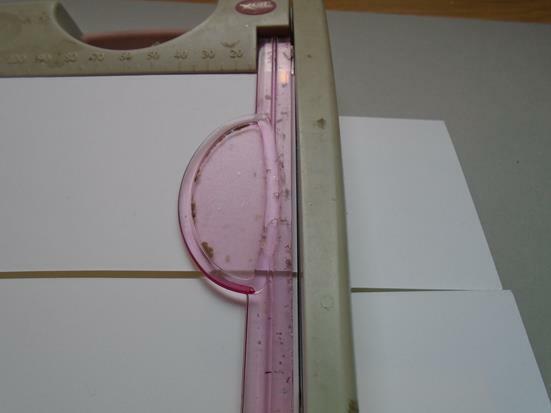 Place the piece in a guillotine and remove the excess card by cutting at this 15cm marking point. Step 6. 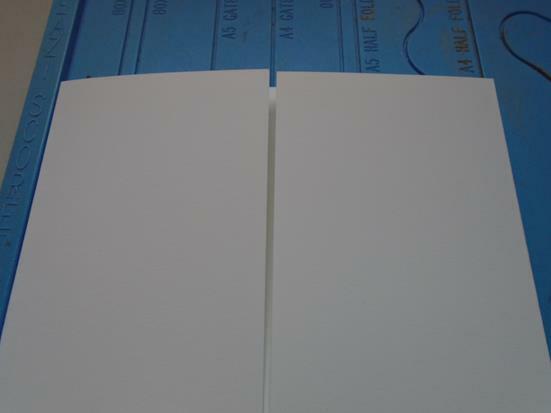 Cut a A4 piece of the Foundations coconut card in half to make 2 – A5 pieces of card. Step 7. 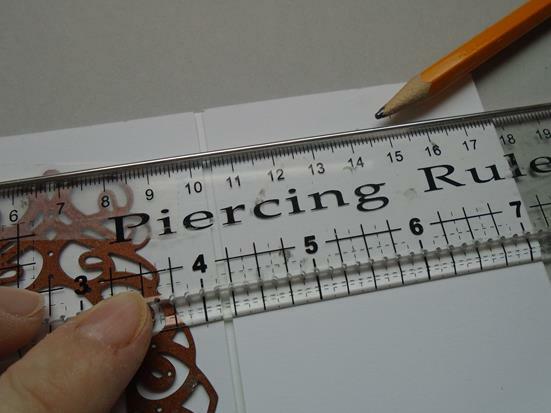 Measure the 1st piece of card at 15cms down the side and repeat the same on the 2nd and then add a 2cm mark to make a tab for the card to be joined later on. Step 8. If you have a score board the you can add the score lines by using the A5 gatefold line and the A4 gatefold lines on the card that has the 2 pencil markings on. Also a centimetre score board will work out well for this. Step 9. Take the other piece of card and score it in half. 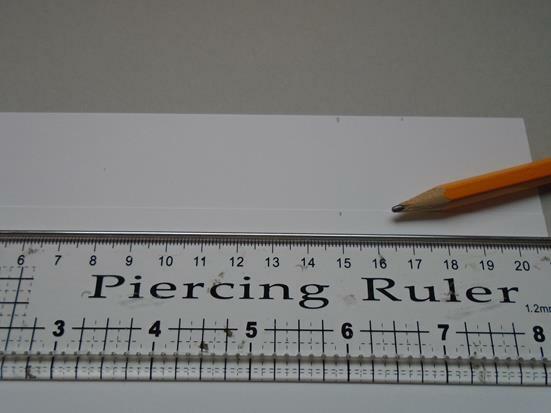 The A4 gatefold line is the measurement need. Step 10. 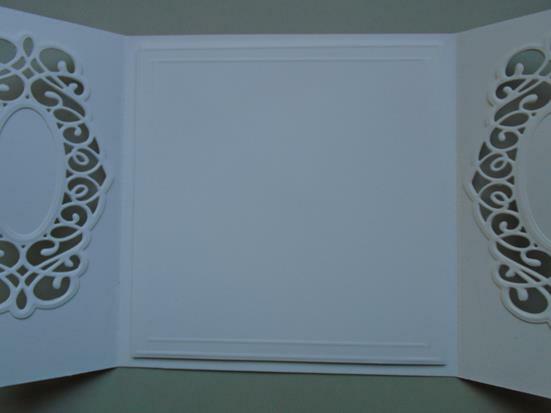 So now you have a trimmed down gatefold card, the folded A5 card with will be the easel mechanism and the tab scored card piece. Step 11. Add a line of double sided tape on the folded inside of the tab and then attach the folded mechanism piece of card onto the tab. Step 12. 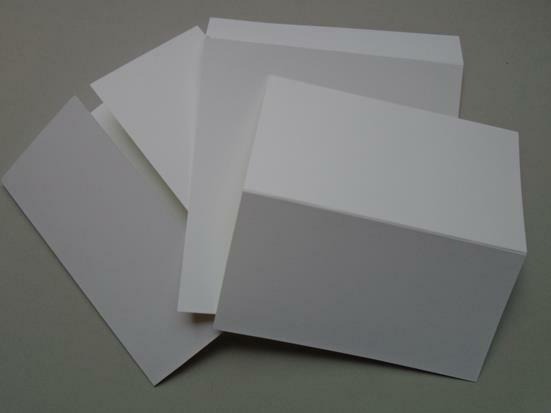 This will create the main body of the easel card. Step 13. 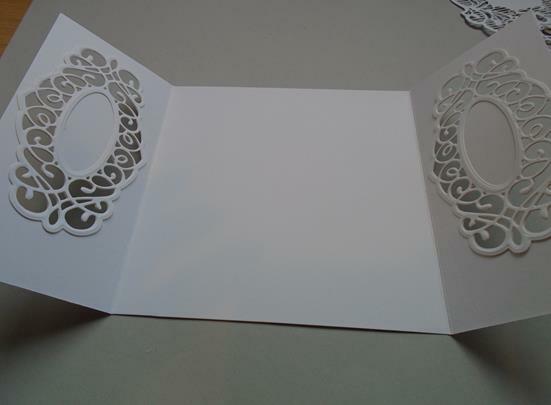 Just for now lay the gatefold onto the folded over piece of card so it shows you how the basic shape of the card will look if you wanted the card not to have the cut out features that will be worked on next. Step 14. 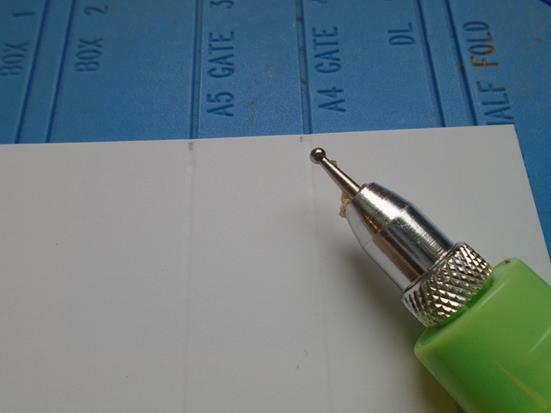 Take the main body of the Sue Wilson Molly die (without the outer die) and secure it in place on the gatefold left hand panel with some low tack tape. Make sure the piece is placed more to the top area of the gatefold. Step 15. 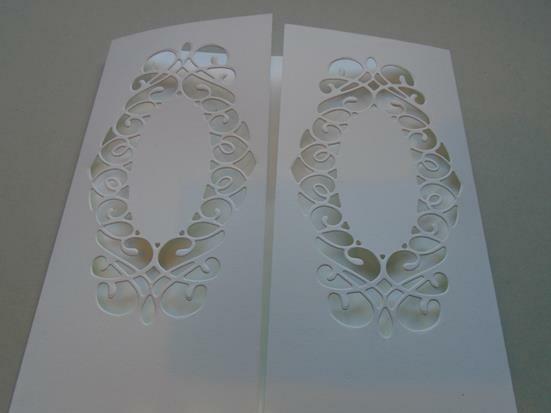 With the fold of the card placed on the edge of the cutting mat place the die through the Grand Calibur machine to cut the piece using the base plate and cutting mat. Step 16. 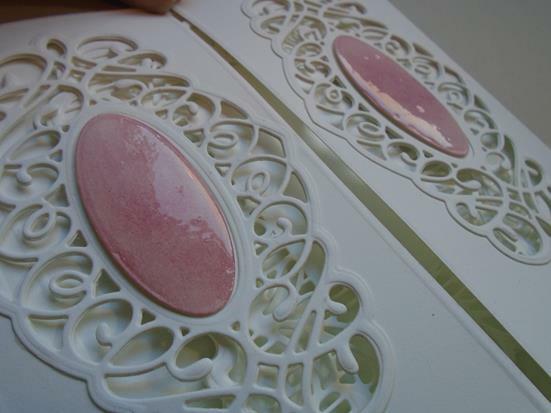 This is just one pass, so now go ahead and emboss the piece using the pink plate, the tan mat, the card & die and then the base plate. 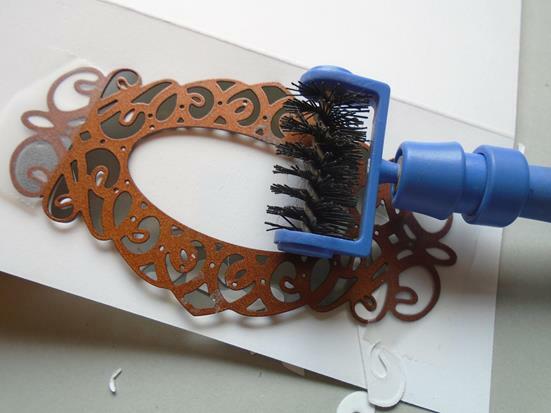 The embossing ensured the all the pieces were cut. If not run the piece back and forth to cut it further but I just wanted to show you that it worked with the embossing part too. For this project you can only have the die in a width way rather than your usual portrait position which will cut the die better. Step 17. Run the Spellbinder tool in one over the die to help release the small pieces of card from the card & die. Step 18. 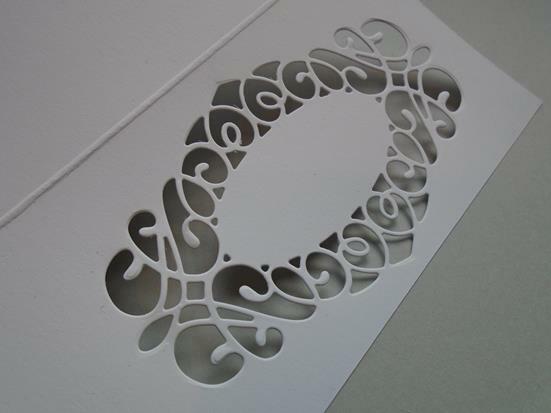 Here is the completed look, so very delicate but so easy to cut too on the 220 – 240gsm Foundations card. Step 19. Place the die back into the die shape and then draw a mark where the die needs to be on the opposite gatefold panel. Step 20. Secure the die in place and repeat the last few steps to cut and then emboss the panel. 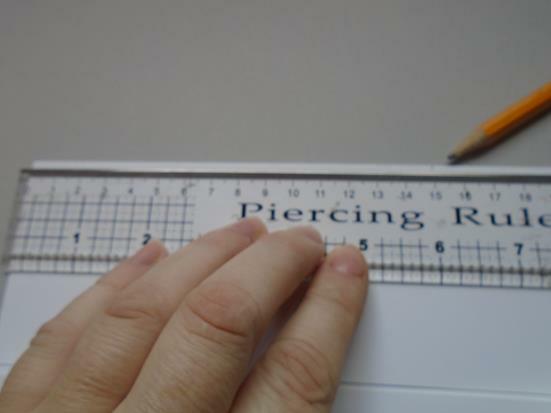 Make sure the card is opened flat and the scored line is on the edge of the mat before cutting. Step 21. 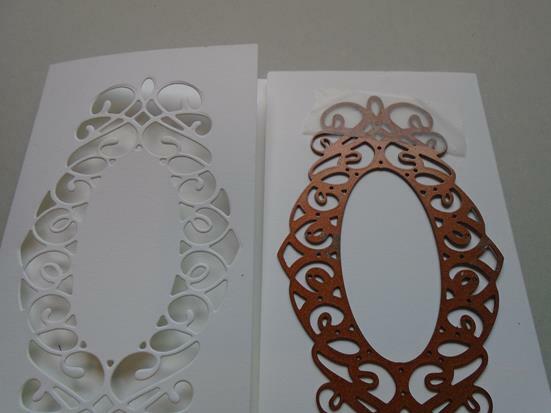 Now you will have the 2 intricate panels on the gatefold card. Step 22. Cut & emboss the Sue Wilson Indian Ocean collection ~ Mauritius die shape out using the 2 outer dies on a piece Foundations coconut card. Step 24. 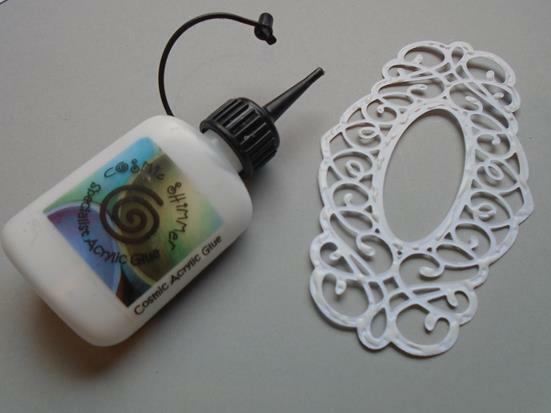 Add some Cosmic Shimmer dries clear glue onto the reverse of one of the Molly frames. Step 25. Stick the frame onto the inside over the already cut out frame panel. 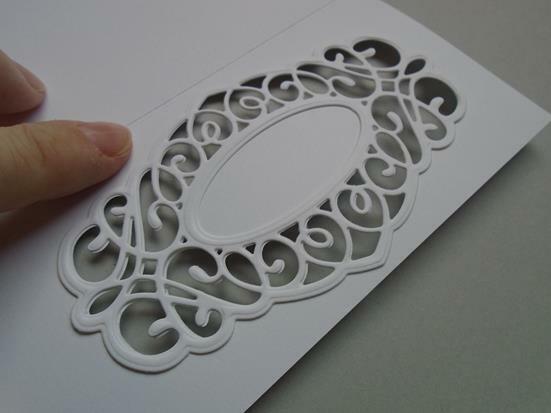 This will just enhance the cut out panel by giving it an embossed look. Step 26. Repeat this on the other inside panel. Step 27. Now add the other 2 panels onto the front of the card – making sure the die shapes line up perfectly as they are placed down. Step 28. Cut a panel measuring 137mm wide and 140mm deep in the coconut card. 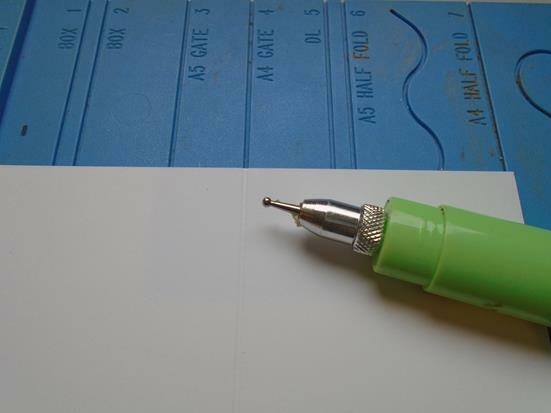 Use your score board to add a double embossed line around the outside of panel for a nice finish. 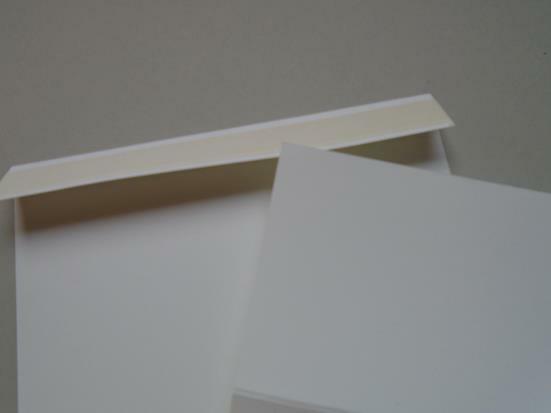 Add some foam tape to attach this panel on the middle section of the gatefold card. Step 29. 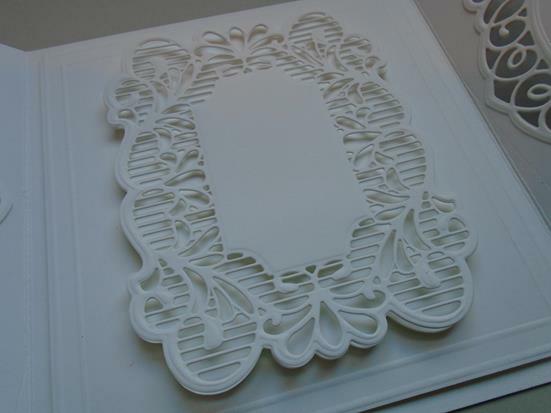 Place the solid frame onto the centre of the easel card panel using foam tape and then add some foam pads on the solid inner area of the intricate frame. Now place that over the solid frame below. Step 30. 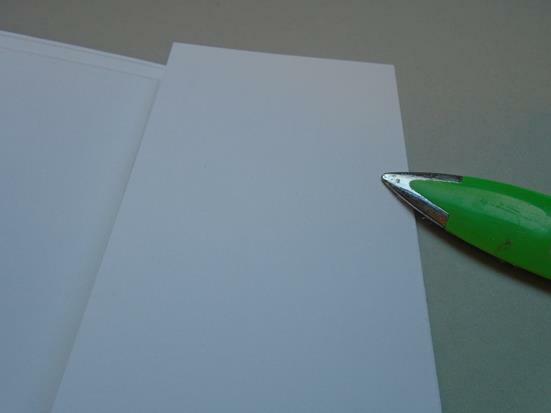 Use a bone folder to burnish the edges of the gatefold card so that they fall back into place properly after they have been worked on. Step 31. 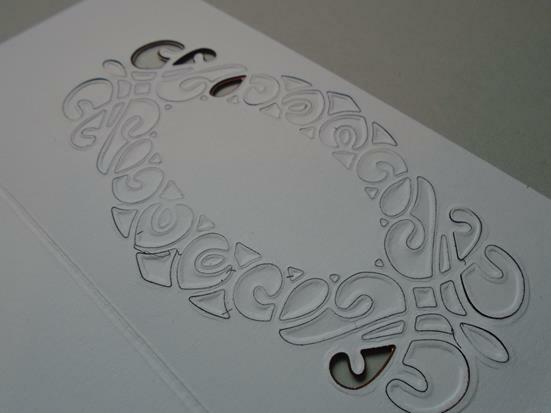 This is optional, run an embossed line area the inner gatefold panel so this will be seen from the front of the card. Step 32. Burnish the fold on the piece of card that has been scored in half on the front panel. The easel mechanism part. Step 33. 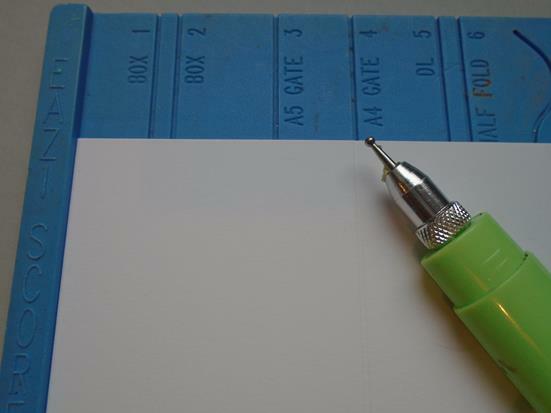 Add 4 rows of double sided tape on the bottom area of the easel card and then add the gatefold card onto the tape. Step 34. 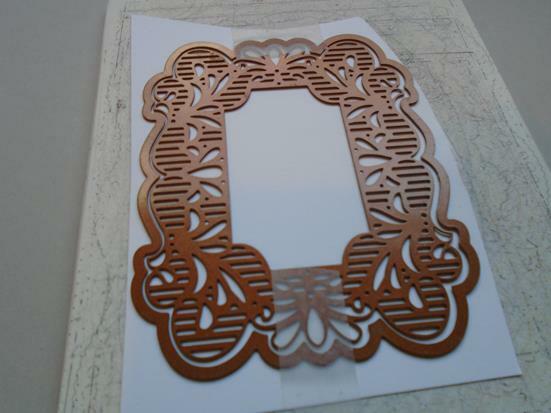 This has now became the fully decorated base card shape for this style card looks. Now for a few simple finishes to enhance the piece. Step 35. 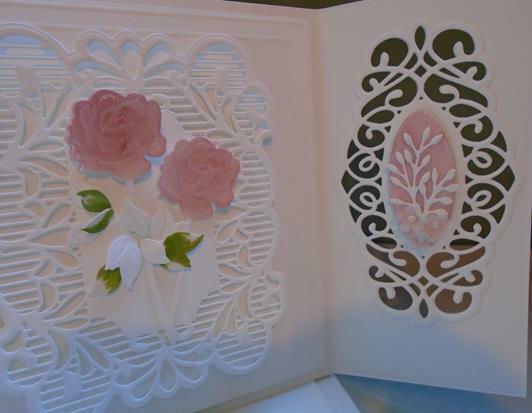 Cut 3 of the Sue Wilson wild rose die flowers in the coconut card and then emboss the flowers. 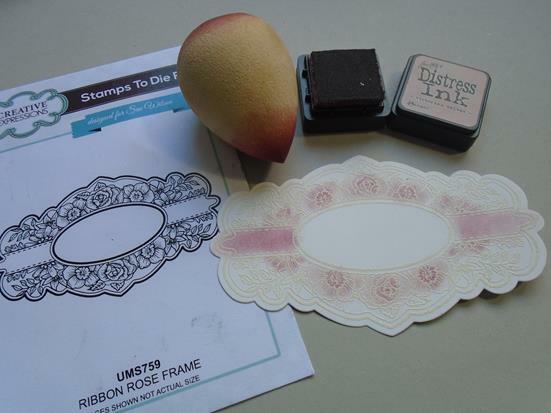 Now add some of the Tim Holtz Victorian velvet ink onto a Creative Expressions smoothie and ink the flowers head up. 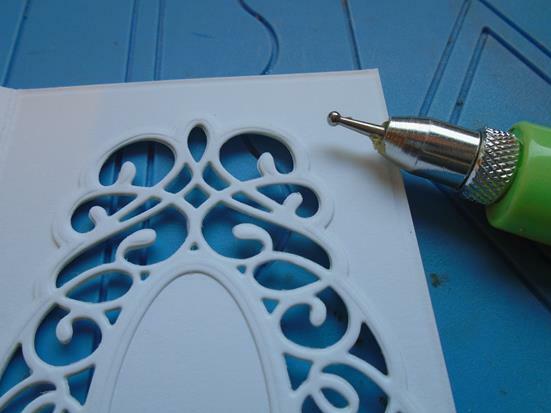 Go in lightly and then add some more ink over the raised embossed areas as this will add depth to the piece. Add some glossy accents onto 2 of the flower heads and set them a side to dry. 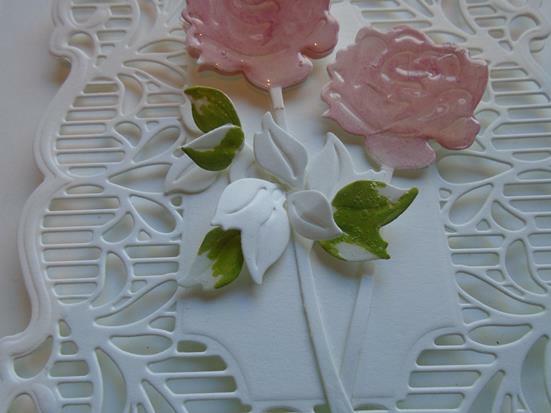 A 3rd flower has been used underneath so that it will give a raised decoupage look to the finished flower but there is no need to add the glossy accents to this. Step 36. 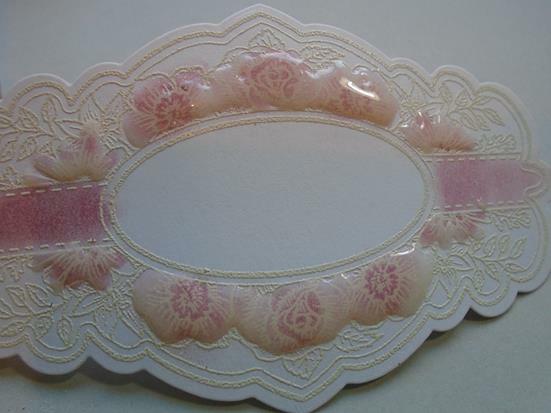 Stamp the rose ribbon stamp onto a piece of coconut card using the Perfect Medium and then tip Cosmic Shimmer white embossing powder over the ink before heat setting the powder. 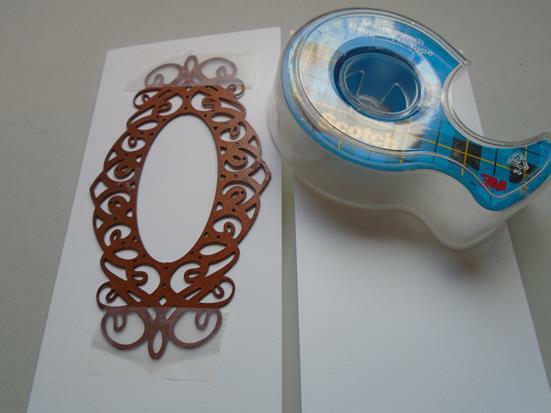 Cut the stamp out using the solid outer Sue Wilson Molly die as it is designed to work with this stamp. Use the tip of the smoothie to add some Victorian velvet ink onto the roses and the ribbon area of the image. Step 37. You might want to use the other Sue Wilson delicate floral stamp that also fits the Molly die and will give you a slightly different look. Step 38. 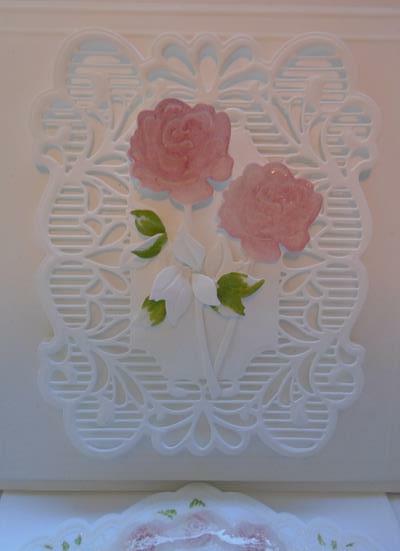 Add some of the glossy accents onto the rose area of the piece and set a side to dry. Step 39. 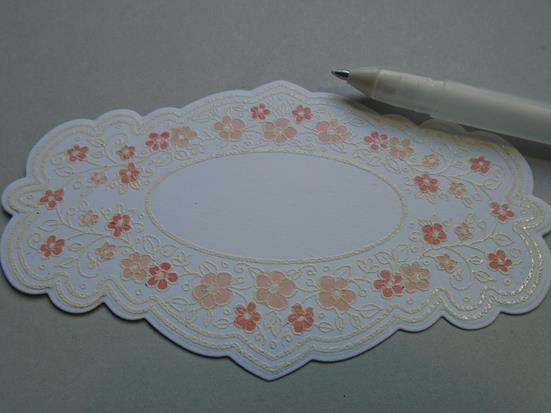 Colour the 4 oval panels using the Victorian velvet ink and then glossy accents has been added to these panels. 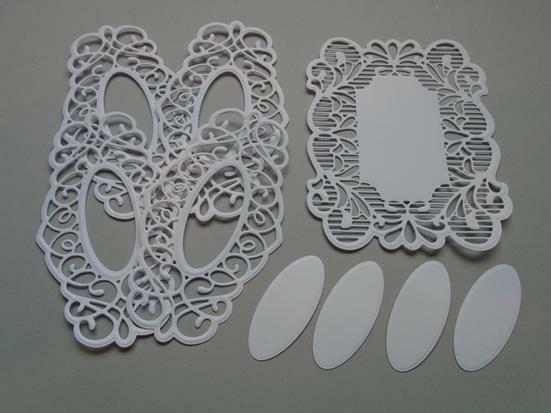 Once they are dry add then on the centre of the Molly die shapes using foam pads for added dimension. Step 40. Place the base – just inked rose on the left hand side of the frame and the add the other glossy accents rose to the side of the rose and slightly down from the main rose. 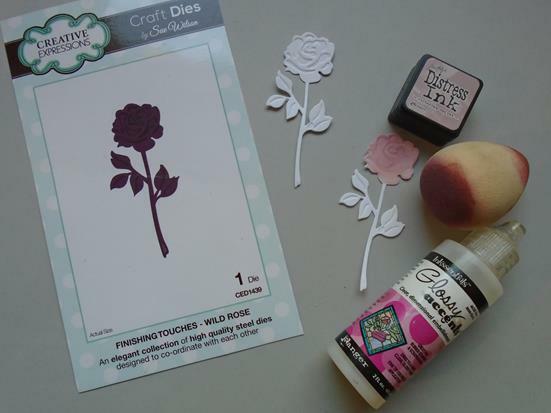 Snip the head off the 3rd rose and just use the glossy accent rose head to decoupage the main flower. Arrange some of the extra white leaves from the snipped off rose to bulk out the rose stems. Step 41. You can add a touch of the Graphmaster no. 42 pen to the edges of the leaves and again add some glossy accents for a nice finish to the piece. Add them behind the white leaves once they are dry. Step 42. 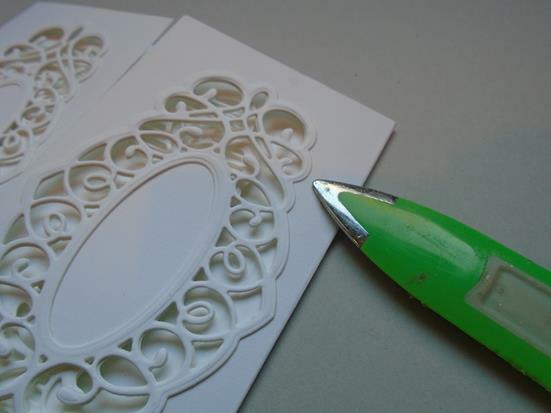 Cut 4 sprigs of the olive sprig die and add 2 of each to the inner panels of the card. 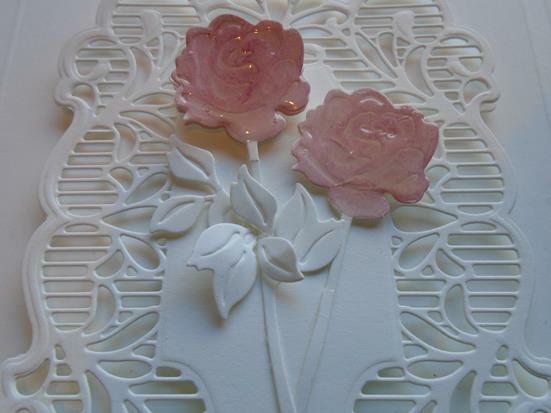 Cut 6 small flowers in vellum from the flower die on the delicate garden frame die and add 3 to the base of the leaves on each panel. 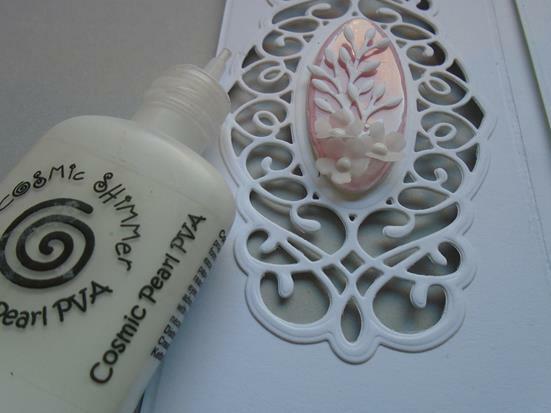 Now add a dot of the Cosmic Shimmer pearl PVA glue to each centre of the flowers for a faux look to flowers. Step 43. Add some of the green no42. 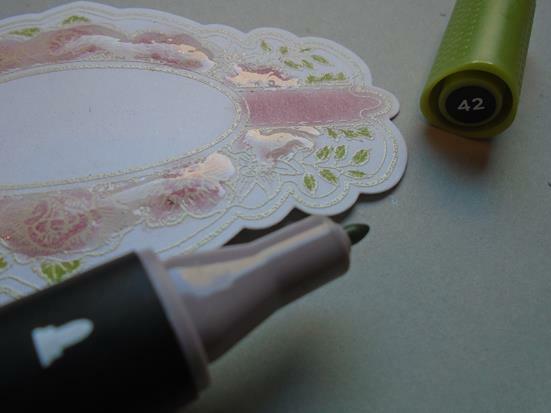 pen to the leaves on the ribbon frame making sure you stay within the white embossed line. Step 44. 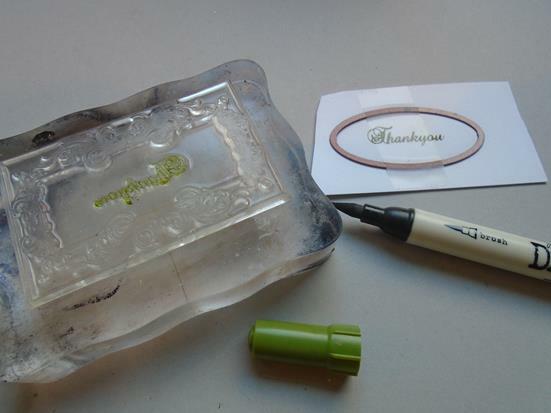 Use a peeled paint distress marker to colour in the centre of the Phill Martin sentiment stamp. 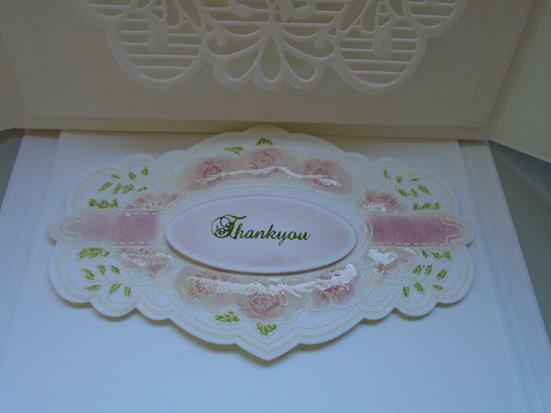 Stamp the sentiment onto a piece of coconut card before cutting the piece out using the oval die from the Molly set. Step 45a. 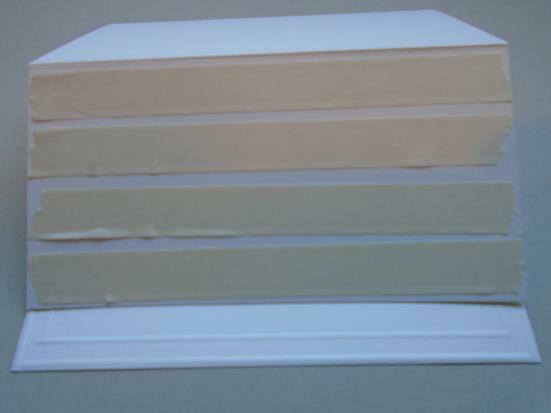 Attach the worked panel on the inside of the easel card on some foam tape to allow the piece to be used as a stopper for the easel card. Step 45b To send the send fold the piece flat and then tie a silky green ribbon around the whole card to keep the flaps in place. Step 46. 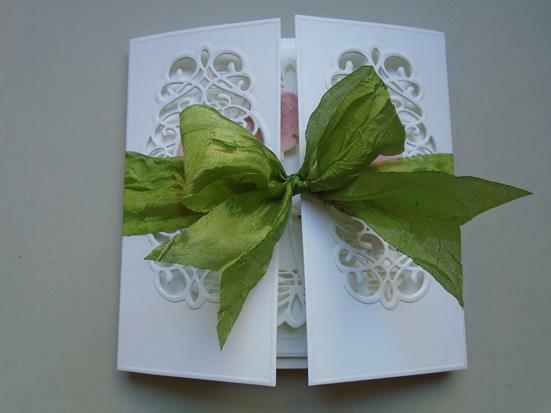 This way it will give the recipient a lovely surprise when the card is opened. Step 47. The gatefold will now be seen when opened. Step 48. Then the gatefold piece can be placed behind the stopper to show the full effect of the card. Step 49. 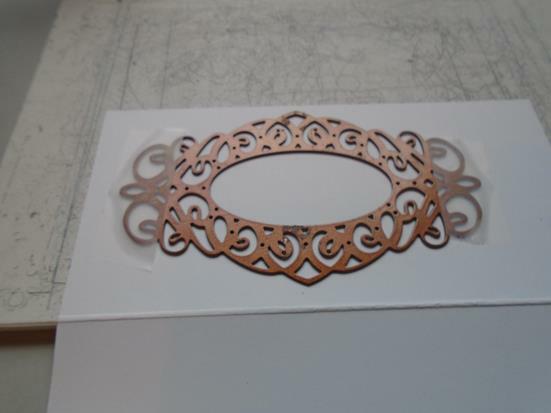 ….. Just the stopper step again to show the inside of the design. Step 50. The roses just help the design pop with the simple colours used. Why not make it a golden rose for a special 50th anniversary card or make it relate to the many other anniversaries colours/themes as this would add a real focal point if selling the cards. Step 51. 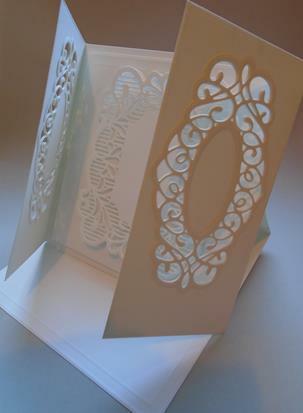 Here is the side panel with the intricate panel cut out on the gatefold area.